In jazz music, alterations are used for all types of chords, however, they are most often applied to dominant chords. So let's start with the fifth of V7, it that can be altered with a sharp (#) or a flat (b). So we can get two altered chords named 7b5 or 7#5. Please note that the b5 and the #11 are the same notes, they are enharmonic like the #5 and the b13 that are enharmonic too, so there are two other possibilities, 7#5 and 7b13. However, it is better to use the b5 and #5 extensions as shown in the shapes below. Here are four guitar neck diagrams to play 7b5 chords. These four diagrams take the same voicings as above, but with an augmented fifth. Please note that 7#5 chords can be written 7aug or 7+5 or aug7. The ninth of a dominant chord can be lowered or raised by a half-step, thus giving two altered dominant chords : 7b9 and 7#9. Here are eight guitar diagrams to play altered dominant chords. Notice that there are two rootless chord voicings, meaning that the root tone is not play but simply represented by a red circle. The b9 is generally used to alter the dominant 7 chord of a minor II-V-I chord progression giving a iim7 - V7b9 - Im(maj7) sequence. Now the same voicings but with a #9 instead of a b9. Please note that 7#9 chords are dominant chords with a major ninth. Altered dominant chords can contain one or more alterations, the choice depends on the melody. They are most of the time simplified and written "ALT", for example G7#5b13 can be written G7alt. It means that the altered notes are not specified, you can decide which alteration you add to the dominant 7 chord. 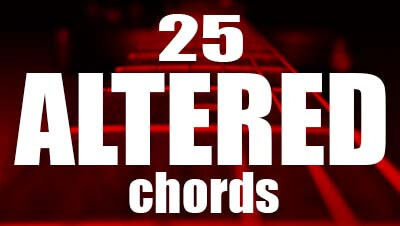 Here are some chord shapes that will help you to hear some of these altered chords.